Conjunctivitis is one of the most occurring eye problems with children. It is characterized by the presence of inflammation, redness, and itching of the eyes. When there is conjunctivitis, you will notice that there may be yellow, greenish, white or clear liquid that collects in the eyes. It is also called the “pinkeye” because, when it occurs, the white part of the eye and the insides of the eyelids turn pink. It may affect one eye at first, but there may be times that it can in the onset affect both. Conjunctivitis is usually not painful, but to have one means discomfort since it can be a bit itchy. It usually lasts for about a week or even less. It can be treated or it can be left alone and it will simply go away. 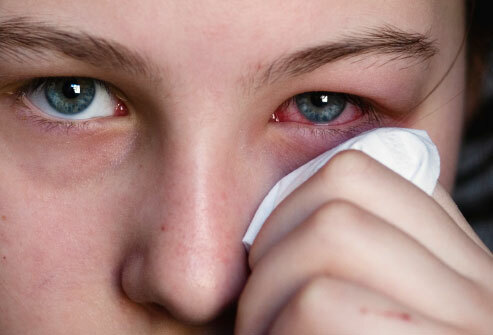 Kids normally contract conjunctivitis from infectious bacteria. Some kids, however, who suffer from ear infections almost always will get conjunctivitis as they are of the same kind of infectious bacteria. The same could be said of the same bacteria causing your colds. Conjunctivitis is highly contagious. It can actually be contracted by mere touch when you get contact with the hands of an infected person who touched his eyes. When your hands get contact with your eyes the contagion will be completed. Hence, the proper and frequent washing of hands is most recommended. It is also advised that you should wash your hands with warm and soapy water. But not all conjunctivitis is contagious like in cases where kids got conjunctivitis theirs from allergies. If your feel itchiness in your eyes and you notice that they are reddish or more crusty than usual, you should have them checked since the disease spreads easily. Your doctor will know if what you have is actually conjunctivitis simply by looking at your eyes carefully. He will also inquire if you’re vision is impaired or if you have gotten something in contact with your eye recently. To rule out the irritation as caused by allergies or other illnesses, he may examine your ears for the presence of other bacteria. If you’re conjunctivitis was caused by bacteria, he will most likely prescribe antibiotic eye drops. But if your conjunctivitis is caused by your allergies, your doctor may prescribe special eye drops to lessen the irritation. If you are already with conjunctivitis and your eyes are causing discomfort, try using cool or warm washcloth on your eyes but be sure to control yourself from touching your eyes. Also, make sure that you always wash your hands to avoid spreading it to others.